I am super excited to be sharing this post on Best Delhi Mid-Budget Designer today with all you Delhi brides to be. If you are planning your wedding shopping in Delhi, and are looking for a one stop shop for all your bridal and pre-bridal wear. Then Megha & Jigar should be your first stop. They are the Best Delhi Mid-Budget Designers I could find. Prices for Megha & Jigar lehengas start from INR 20k for light Pre-Wedding lehengas. Megha & Jigar Bridal Lehengas are usually in the INR 65k to INR 1.2 Lakh price range. Now some of you might say what has happened to this Frugal2Fab lady. 50k+ is not mid budget. If it were other cities, I would totally agree. But three years staying in Delhi NCR, I have come to realise that Delhi is expensive. Especially when it comes to wedding wear. It is so hard to find anything in the INR 20k, 30k price range. On Frugal2Fab, I have pretty much exhausted the lehenga search in Delhi. In case you have missed those posts, you can have a look here. There are few standalone stores that are good to check out in Delhi NCR. So Why Is Megha & Jigar The Best Delhi Mid-Budget Designer? I have known the brand for a long time now. But sometimes, with so many designers and labels floating in my head, I just missed talking about them. Let me start by saying Megha & Jigar have an amazing collection of lehengas. Both bridal, pre-bridal and festive lehengas. Some of their outfits are internets most trending designs ever. In fact, I didn’t even know some of these trending lehengas were from this label. Anybody remember these two outfits? The peach lehenga was probably the first ever mirror work lehenga I had seen since my Frugal2Fab blogging days. I remember I absolutely loved the concept of mirror work lehengas. Now in 2018, obviously there are tons of new designers who have made mirror work lehengas their signature style. The thing about Megha & Jigar being the Best Delhi Mid-Budget Designer is that you can really search through a variety of lehengas in different price points. Whether your budget is INR 20k or INR 1 Lakh, there are light, semi-heavy and heavy lehenga you can find here. Maybe when you visit the store, you might not have to shell out INR 70k or so but you may just find something pretty awesome in the INR 40k range. That’s why I call them the Best Delhi Mid-Budget Designer. They give you options that is usually not available easily anywhere else in Delhi. Since I have loads to share from their collection, including awesome lehenga prices, I am dividing this blog post into wedding functions where you can opt to wear Megha and Jigar creations. Keep in mind, these are from their heavy bridal range. So most of the prices are INR 50k or upwards. But if you visit their website, you will see tons of options below INR 30k as well. Byah is inspired greatly by regality and reverant nature of Indian marriages. Traditional and classic red teamed with gold hand-embroidery or a unique contrast of red, white and pink embracing floral pattern all over. Two of my favourite bridal pieces from Megha & Jigar bridal collection. I am sticking to reds for bridal because the colour is universally loved by all. The traditional golds and reds look good on everybody. But if you want a trendy modern touch go for the left one. It has a beautiful contrasting mint second dupatta that breaks the monotony of red. When it comes to finding gorgeous heavy bridal wear in Delhi, get ready to shell out INR 1 Lakh+ for a designer lehenga. I’m not talking Chandni Chowk ‘designer replica’ lehengas. Authentic designer lehengas. Megha & Jigar give you the option to wear bridal lehengas from their collection starting as low as INR 40-50k. For an established designer brand, this is the Best Delhi Mid-Budget Designer lehengas you can buy in this city. Featuring rose red raw silk lehenga with zari and zardosi work boarder paired with matka shaped embroidered raw silk blouse and a sequin zardosi work dupatta giving you a royal and a maharani look. I absolutely love this bridal piece. That gorgeous traditional red with gold is a classic wedding lehenga. It is a bit pricey though, but looks sensational. If you are having your nuptials right after the reception, and don’t wish to splurge, then buying a single lehenga like this is perfect. It will work beautifully for your reception as well as for your pheras. You can choose to drape the dupatta differently to give it a new look. If you are not a red bridal lehenga fan, fret not. This blog post is going to cover a lot of different shades of Megha & Jigar lehengas. You’re going to love it all. Their range is quite vast. The one thing that I love about their label is that they do everything. You will see florals, pastels, bright pop colour lehengas, and obviously your traditional favourites. You really are spoilt for choice in this one store. I found some stunning peacock blue green shade heavy lehengas that you can wear for the sangeet night or even for your reception. If you have a budget of around INR 1 Lakh, then Megha & Jigar lehengas are probably the best you’ll get in the price range anywhere in Delhi. This one is my personal pick for budget brides. So many of you’ll ask me for designer replicas in the INR 60k range. Well, why look at replicas, when you can get authentic heavy bridal designer lehengas for a little bit more. It is worth stretching when you’re investing a big sum on your wedding lehenga. I was probably most excited to see these. You know my recent love for chikankari lehengas. They are trending this season, and if you have been wondering where to get one from, now you know. Lucknowi fabric by default is a tad bit expensive. Usually the normal kurta fabrics can range anywhere from INR 1000 to INR 4000 a metre. So typically these lehengas are always on the pricier side. But the good part about owning a Lucknowi lehenga is that, it has tremendous reusability options. You can reuse the dupatta separately. The gorgeous lehenga skirt can be worn in any of the festive occasions post wedding, and the outfits don’t look tacky at all. This elegant looking set features a baby pink lakhnavi lehenga with gold zardozi mukesh and threadwork embroidery. The lakhnavi lehenga is paired with gold zardozi mukesh and threadwork blouse and a net butti dupatta with heavy zardozi boarder. 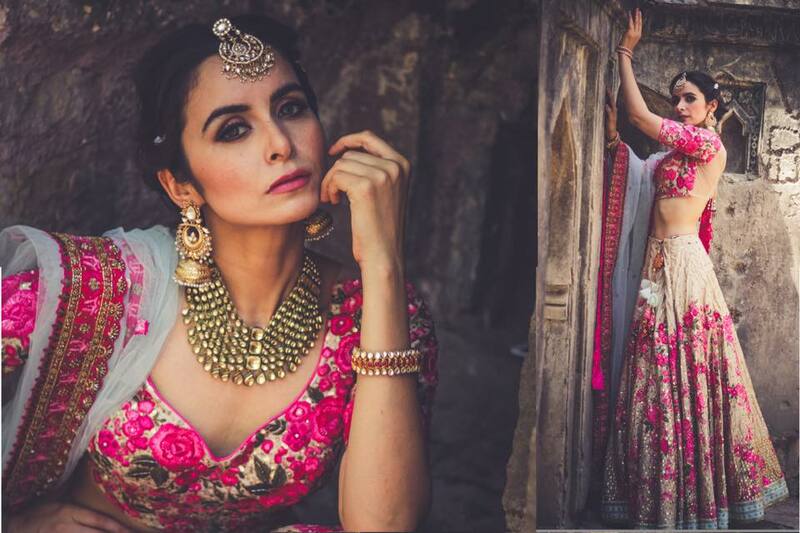 Featuring a baby pink lakhnavi lehenga with zardozi & Swarovski work preferred by village craftsmen. This complete set comes with a handcrafted blouse, lehenga and a butti net dupatta with a heavy zardozi boarder. Featuring Peach Lucknowi Georgette flary Lehenga with Mukesh and zardozi embroidery paired with lucknowi and zardozi work dupatta and blouse. it has been inspired from the nawabi culture of lucknow. Floral lehengas have been in wedding fashion since years now. If you are looking for some fun playful colours to wear to your mehendi function, then I would highly recommend going for these. They are dainty, beautiful bridal lehengas. If you are a sister of the bride, then you can wear these floral lehengas even to the wedding ceremony. I understand if you tell me that you don’t want to wear a lehenga to every single event. I agree. It doesn’t make any sense. Sangeet/cocktail party is one event when you can really experiment with your outfit choice. Here are some of my favourites from Megha & Jigar. Always wanted to wear a white gown like in the west, buy with a twist to the outfit? Well, Megha and Jigar have fantastic options to choose from. If you are having a theme party, these victorian dresses are a must buy. Given that it is in the INR 50k range, it does make it into the slightly affordable category. Do you have any other recommendations for Best Delhi Mid-Budget Designer?